This is the story of Neil and Yvonne Armitage, a couple of New Zealanders in their sixties who, in May and June 2009 broke from their own conventions to experience a six week sailing adventure in Greece. The dream became a reality. This is the third part of the logbook that describes this adventure. Click on the thumbnails to see a larger 800x600 photo in a new window. We left Lefkas town quay in a very heavy down pour that lasted until we were through the 9:00am bridge opening. This was to be a longish day so with a light breeze on our nose we motored for 2 hours to put about 10 miles or so behind us. Managed to get a good 2 hours sailing when the breeze got up to 8-9 knots, even took a couple of rolls in the genoa when it reached 17 knots. Eventually the breeze died away and the motor had to take over again until 3 miles out of Parga when we set sail again for a great 5-6 knot beat into Port. 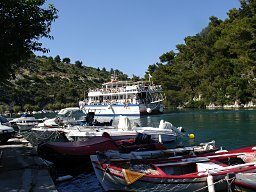 The small harbour of Parga was filled with a couple of flotillas; we anchored in the bay amongst the wash of the water sport boats until they retreated after the customers had gone home. A very pretty area, great sandy beach that is hugely popular with land based tourism. We dined on board tonight, staying outside watching a fantastic moon and star show and enjoying the balmy evening. Parga, a very pretty area and hugely popular with tourists. Mainland Greece is often overlooked (also see Thasos for instance). After lunch we left Parga motored for an hour then had great sailing all the way to Gaios on the island of Paxos. Doused sail in the lee of Nisis Panayia and motored around to the north channel and join a queue of yachts mooring on the north quay. Gaios is one of the prettiest places we had come across so far, the harbour and access via the north and south channels resembles a river with tripper boats looking very much like riverboats. Our plan, as in the inland sea was to try and take advantage of a predominant north-northwest wind and criss-cross the south Corfu channel. The predominant north-northwest wind had not yet settled so we were still at the vagaries of an unstable wind system. Gaios, the north channel resembles a river and tripper boats look like river boats. Motoring out of Gaios onto a glassy sea heading for Platarious we sensed a breeze from astern but not enough to try and sail by until we turned into Ormous Platarius where a good breeze filled in giving us a respectable reach for 2 miles into the harbour. The irony was mooring in a 12 knot cross wind after being becalmed almost all of the day. Again the following day we motored out of Ormous Platarius with the breeze directly ahead, once out into the channel we tried to sail but the breeze subsided but we managed to creep along in flukey winds across to Petriti. The quay and the outer mole were crowded with flotilla yachts so we anchored in the bay along with several other yachts. The fluky winds of the day turned into a steady north to northwest wind, the mole only partly sheltered us from a swell so we were rocking all night. 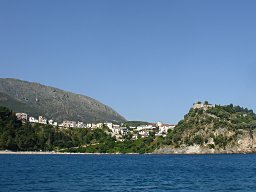 Gouvia marina, Corfu, where most yacht charter companies are located. 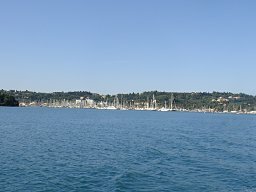 By morning the northwest breeze had really set in, we were keen to get to Corfu and spend the day wandering through the town so left Petriti by 8:30am and motored into a head wind all morning. Rounded Ak Sidhero in a moderate sea and located Gouvia marina where we were directed to a berth on the outside at the end of the northeast arm of the marina. Mooring stern to with a lazy line in the force 5 crosswind was tricky. Formalities completed we located the bus stop and went into Corfu city for the afternoon. The old town was quite delightful with narrow streets and the Venetian architectural style of buildings. It was still mid June and the tourist invasion hadn’t really begun; the streets and alleys were not choked with a myriad of tourists as the pilot might have suggested, see guide to yacht charters. 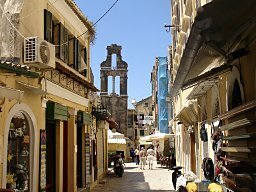 Corfu, the streets and alleys were not choked with a myriad of tourists. Most charter yachts start from Gouvia marina and not nearby Corfu town. On returning to the marina later in the afternoon the breeze had increased and “Spyros” was being battered by a Force 6 wind from the north. She was leaning 10° with waves breaking over the deck, we closed all hatches and our usual drink in the cockpit was quite unthinkable. I had a few words with the staff at marina office suggesting that if I had to pay full marina fees then I must be entitled to a more sheltered berth. After a few more words they did agree and arranged for us to move to a berth inside the marina, leaving our original berth in the conditions proved to be challenging. At least the wonderful meal at Harry’s Taverna in Kondokali redeemed the day.